Human ingenuity, or rather… A.I. ingenuity. anything with an automated system that can track down an object that is moving at 16,777 miles per hour and attach itself with just a 2-centimeter leeway, is pretty damn awesome in Giz’s book. Just reminds us what’s coming in the years ahead. The last part of the video has the mission control people announcing the vessel docking to the Internation Space Station. What an age we’re in now,… the video almost has an uncanny regularity to it, no? The risk taken by these visionaries, engineers, and control room technicians alike… could have failed. What happens if it had missed the mark just outside of the 2-centimeter target? Bumped it the wrong way? Rolled out of its trajectory with a crucial 3.5 ton payload? But no, the risk is taken, committed to. I can see it now. Practical space travel progressing leaps and bounds from this little, but successful accomplishment. 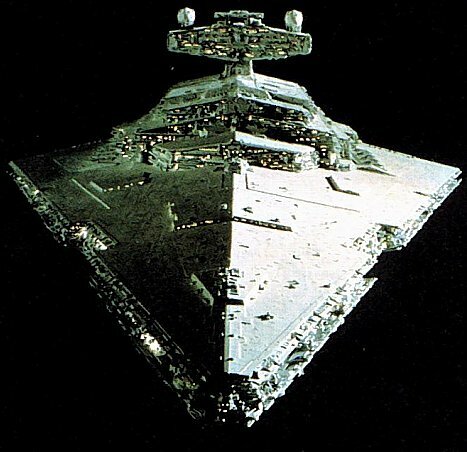 Ok, maybe not, but at least if an Imperial Star Destroyer ever does a fly-by, we’ll know how to take on a little tractor-beam interception, and do it well. A look back at company logos and their origins… very cool. Check out the Nokia one… they used to sell what? !